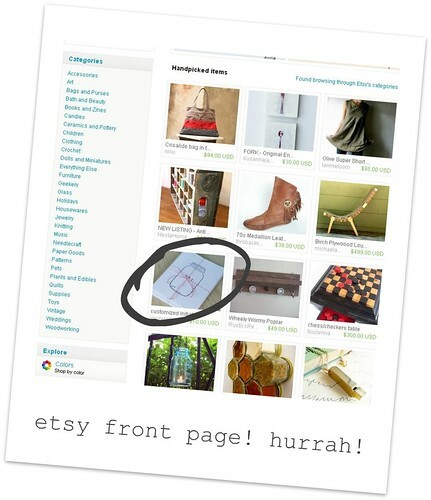 Someone was sweet enough to message me yesterday and let me know that one of my items had made the front page of etsy. It's only happened once before, and it's seriously the most exciting thing! Weeee! Just thinking that one of my items was the first thing you'd see when you go to the site is just ridiculously thrilling. 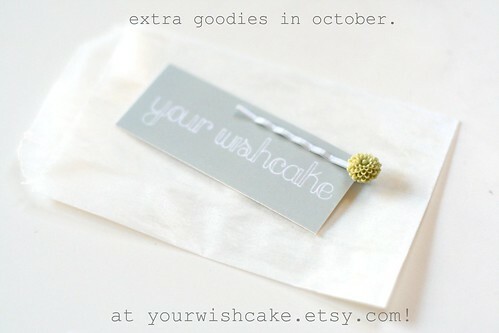 During October, if you spend $15 or more on items from my shop, you will receive a lovely mini-mum hair pin for free! Of course, this is only while supplies last (how official and ridiculous do I sound right now?) but if I run out, I'll be able to tuck in an extra treat, no matter what. The hair pins come in a bunch of different colors and there is no guarantee which color you will get (of course, if you want to ask, I'll try to get you the one you want!). So, anyway, if any of you are interested, head on over to the shop and take a gander! I'll be listing a bunch of new items in the weeks to come - it's almost time to start thinking about Christmas shopping and all those shenanigans! Yikes! This year I plan on shopping 100% handmade for gifts. 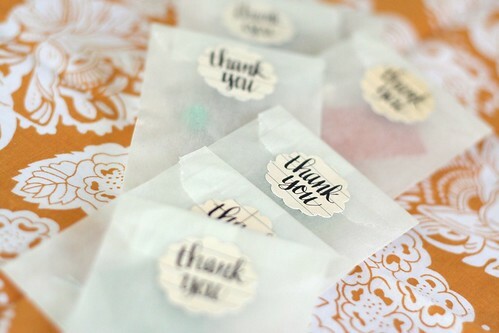 I'll either make gifts myself, or purchase items from some of my favorite etsy shops. I've noticed that people have done this before and I think it would be an incredible challenge. And how awesome would it be to know that you are supporting independent artists and crafters, as opposed to huge corporations? Buying handmade is the way to go (and I'm not just saying that because I have a shop of my own - I'm not that shady, I swear). 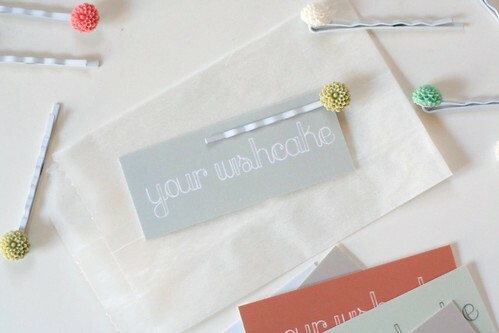 There's just nothing quite like that personal touch you find with handmade items, you know? Congratulations on making the front page! I wore one of the mini-mum hair pains in my hair yesterday. I love buying handmade gifts for my friends for various holidays or just because. I'm with you on the buying/giving handmade this year! I've tried to do that before, but this year? It's FO REAL YO. wahoo! i always love your pins. so cute. Congratss so happy for youuu! can i just say that if we knew each other in real life we would be best friends? ok thanks! i love reading your blog so much. i get way too excited every time you update. you're just the sweetest, most genuine person, and it's so refreshing! Congratulations on the front page! I saw your cards also posted in the under $20 gift guide on Etsy yesterday! I have also been thinking about buying handmade for Chirstmas this year. Actually I started last month. I realize it's quite early but I saw the cutest things on Etsy! I'm totally with you on buying all homeade this year for Christmas! oh yay!! Congrats to you!! Congrats on being featured on the front page! That's so exciting! Woo!